After some annoying problems getting the game to actually run in the first place, I passed a few idle hours playing through the silly Dot Kareshi -We're 8bit Lovers!- I ~Densetsu No Otome~. 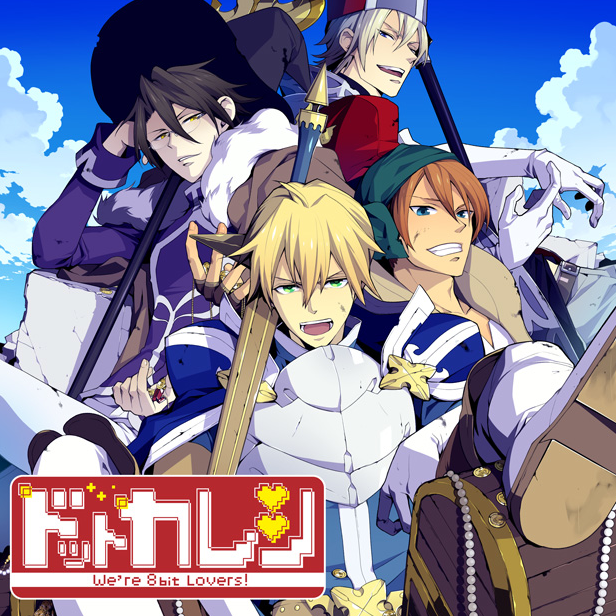 It's a Japanese otome game from Rejet which came out last year for Windows PCs. The premise of the 'Dot Kare' series is that you are a typical female gamer who has spent many hours playing a traditional console-style roleplaying game. Unfortunately, your careless treatment has turned your party members into twisted parodies of the usual RPG staples with major personality flaws. One day, you find yourself trapped inside the game, where you have to complete a quest with your disgruntled (and rather flirtatious) party in order to find your way back to the real world. Dot Kareshi's release format is unusual; it's a series of three drama CDs packed with individual visual novels. 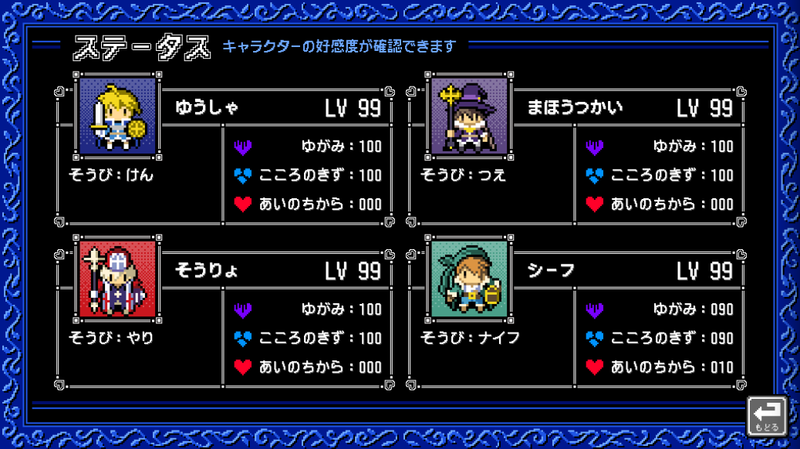 Each CD/game set includes four different characters - the party in this first volume is composed of Hero (Yuusha), Mage (Mahoutsukai), Priest (Souryo) and Thief. I'm going to use simple English renderings of their names for this mini-review instead of the literal Japanese titles to make it easier to understand. Outside of a single joke the guys don't have names of their own and are referred to exclusively by their job titles. 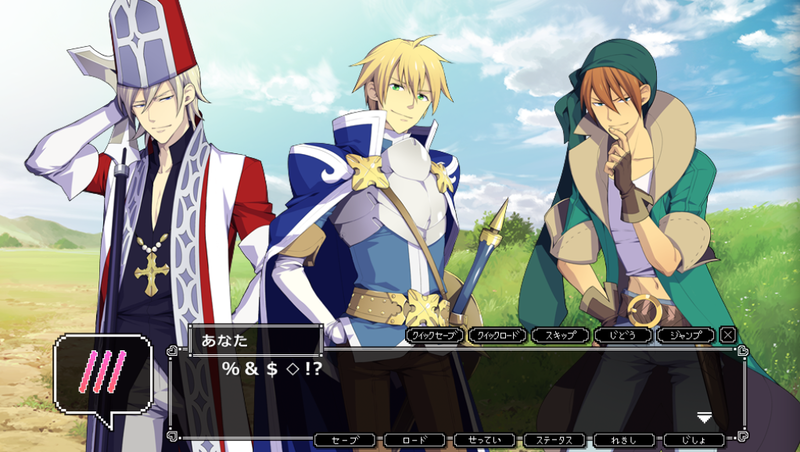 While all of the male characters are fully voiced by well-regarded seiyuu, the main character has no name, face or dialogue aside from exclamations and flustered reactions. I don't often self-insert myself into games but here there's no way not to - most people with an interest in the series can probably relate to a girl with a dark history of mistreating her game characters. The vibrantly-drawn characters have moving mouths and they can even blink as they talk to you. The level of Japanese in Dot Kareshi is very simple with no complex vocabulary aside from a little gaming slang. Many words are written in hiragana instead of kanji to give them an old school RPG feel. During your adventures you can gradually heal your party members' emotional scars by making considerate responses to their questions. Impress them enough and they'll want to go back to the real world with you once the quest is over - otherwise they'll grow fond of you and try to keep you in the game world with them instead. I picked Thief first as he seemed cheerful and cute. His backstory is that you made him steal so much that he became hooked on the thrill of theft - yet once he's stolen something, he immediately loses interest in it. His quest involves sneaking into a dungeon to find a legendary tiara with the rest of the party tagging along unenthusiastically. The party's Mage is a haughty, bespectacled fellow who harbours a deep grudge over the player's attitude. You even went as far as disabling his spellcasting effects in the game's settings to save time, ruining his moments of glory. To repair your relationship you accompany him on a quest for a magic tome in a manor filled with undead monsters. 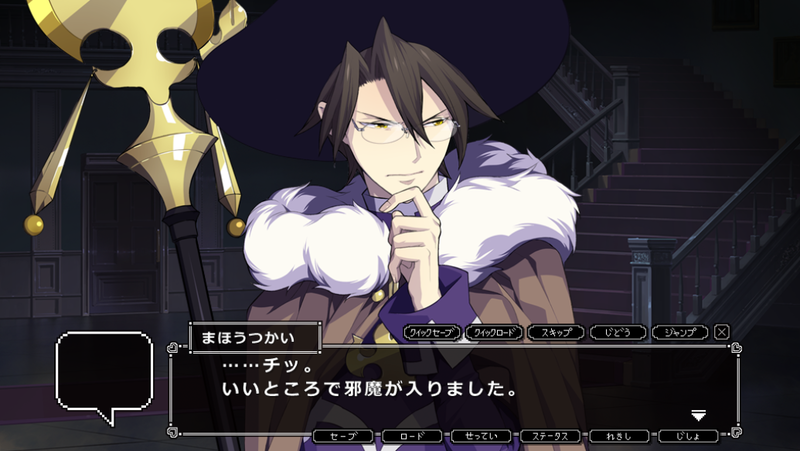 I like Mage's mature personality a lot. I also like it whenever his bitter feelings rise to the surface and cause him to lose his temper. I can relate to Priest so well that this route almost has narcissistic implications. He's become a domineering, self-centred jerk after putting up with the party for so long, but he's actually reliable and views the fights strategically from his vantage point behind the melee characters (who seem rather afraid of him). Priest's quest involves gathering medicinal herbs to save a town from an outbreak of a mysterious disease, and he spends most of it grumbling and flirting while everyone else kills monsters. Last of all is the Hero of the story, a sword-wielding warrior with a strong sense of pride - which you have inadvertently crushed countless time. He seems more concerned with the heroine's feelings than the others and has one of the coolest moments in the game during a difficult boss fight. He certainly has enough bravery to earn his title. Hero was a sweet guy even though straightforward warriors don't tend to be my type. What a delightful game! It's very simple to play and even if you completely screw things up it's a breeze to go back through and make different choices at any time. Because the stories are so short, the silly premise never outstays its welcome. You never really learn too much about the characters, which for me meant that they were all likeable without anyone becoming a firm favourite. The creators don't take it seriously at all and make fun of RPG stereotypes in almost every line of dialogue, often causing me to laugh out loud while playing. There are also a number of suggestive undertones which keep things interesting. I'll definitely be trying out the next two games in the series in due course. The audio CD which came bundled with the game was great too. Each character had their own mini-drama which took place alone with the heroine and the guys were all quite seductive - much more so than in the game version! Kondou Takashi's performance was my firm favourite of the four audio dramas (and uncoincidentally, one of the sauciest). Dot Kareshi is sold out in a few places but copies can still be picked up inexpensively from sites such as Amazon Japan. A very short demo is available on the official website along with a ridiculous patch which strips all of the characters down to their underwear for additional replay value.